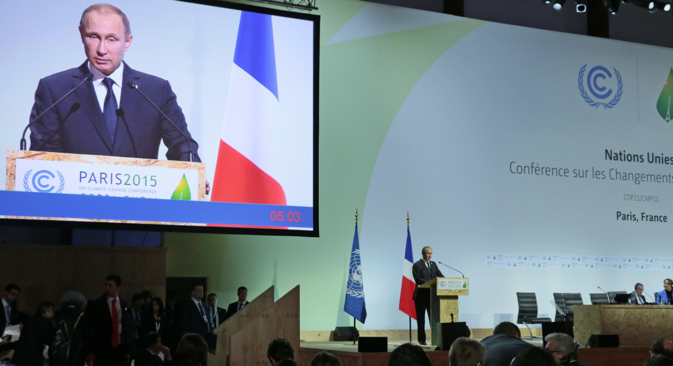 Russia's President Vladimir Putin speaks at the 2015 UN Climate Change Conference (COP21) in Le Bourget, near Paris. Close to 150 leaders from across the world, including US President Barack Obama, Chinese President Xi Jinping, Russian President Vladimir Putin, Brazil’s President Dilma Roussef, Japanese Prime Minister Shinzo Abe and Indian Prime Minister Narendra Modi, gathered in Paris on Monday to launch the critical Conference of Parties (COP), intended to come up with a binding and sustainable agreement on how to tackle climate change. Climate change and environmental degradation are no longer abstract considerations for the future; melting ice-caps on the Arctic, melting glaciers in the Himalayas and record-breaking flooding over the past month in the southern Indian city of Chennai and surrounding areas have brought home the immediacy of the looming disaster of climate change. India has made its position amply clear; it seeks a deal in Paris that “restores balance between ecology and economy” and is based on the principles of justice and equity. “The principle of common but differentiated responsibilities should be the bedrock of our collective enterprise. Anything else would be morally wrong,” Prime Minister Narendra Modi said. This unequivocal reiteration of the principle of “common but differentiated responsibility” (CBDR), which is the guiding principle of the United Nations Framework Convention on Climate Change (UNFCCC), sets at rest speculation about India’s stand. Equity has been the main theme of India’s position in climate talks all these years, and as Modi stated, it is not going to compromise on it. As the world’s largest country, in terms of size, Russia is also working on strategies to adapt to severe environmental changes. While most Russian cities are not prepared to face the kind of change (for example, the killing heat wave of 2010 in Moscow) being wrought by the environment, St. Petersburg has a plan to adapt to climate change. St. Petersburg’s strategy, adopted this year, took four years to develop and was based on plans from Finland, Denmark, the UK and India. The strategy includes measures for mitigating risks and adapting to serious threats, especially floods. Indian cities like Chennai, too, are struggling to cope without any plan about how to cope with climatic change causing severe flooding, that has killed over 100 people so far. Russia’s final position will be adopted, along with the other BRICS nations, by the end of the COP on December 11. Russia has said it would cut carbon emissions by 25-30 per cent (from 1990 levels) by 2030. India, too, has made major commitments in an Action Plan. Called ‘Intended Nationally Determined Contributions’, or INDCs, the plan is built around three elements; a reduction in emissions intensity, or emissions per unit of GDP, an increase in forest cover, and a greater role for renewable energy in power generation. India has committed to a 33 to 35 per cent reduction in emission intensity compared to 2005 levels. India’s position was called a “challenge” by US Secretary of State John Kerry. As a leading developing nation with the aspirations of 1.25 billion people to meet, Indians were outraged by the statement coming from the world’s biggest polluting nation. In a ‘non-paper’ shared with select countries, the US said it wants the wall of differentiation between developed and developing countries done away, along with any notion of historical responsibility. It wants developing countries to also contribute to the climate funds in future and not just the developed countries as is required for the UNFCCC, according to which the Paris agreement is being prepared. The aim was to achieve “climate neutrality,” a controversial term which countries like India have strongly opposed. The USA, unlike most other nations including India and Russia, has not even signed on to the Kyoto Protocol. Along with French President Francois Hollande, the Indian PM on Monday launched the ‘International Solar Alliance’ (ISA) in Paris, which seeks to harness the power of the sun for future energy requirements. Around 120 countries, all located fully or partly between the tropics of Cancer and Capricorn (most of Africa, Asia and Latin America), are expected to join the clean energy initiative. In its launch resolution, the ISA says it seeks to share collective ambitions to reduce the cost of finance and technology that is needed to deploy solar power widely; generation and storage technologies would be adapted to the individual countries’ needs. Russia, not being located within those sunny latitudes, is not part of the Solar Alliance, a Russian official clarified, but is working with India to develop all kinds of clean energy, including solar energy. Atomic energy is a major area in which Russia is helping India to become energy-sufficient. India has already invited China to be part of the Solar Alliance and signed an agreement with that country earlier this year (in May, during Modi’s visit to China) to collaborate on climate change strategies, particularly in international forums (like Paris). According to Indian sources, Prime Minister Modi, during his visit to Moscow later this month, is likely to urge President Putin to adopt a joint collaborative agreement on climate change and the environment.